31 year old suspect who has fled from police numerous times in recent weeks, was located and arrested Monday night. After evading police on multiple occasions, a 31 year old male suspect was located and arrested, with the assistance of a drone and K9. On April 9, 2018, at approximately 11:15 a.m., Fremont Police patrol officers responded to the 4800 block of Piper St. on the report of a male, armed with a firearm, involved in an argument. By the time officers arrived, the male had left. Several residents in the area called and reported that he was running through yards and jumping fences, while still armed with the gun. Additional officers responded to the area to help conduct yard searches as well as utilized a K9 trailing dog. As a precautionary measure, three schools were placed on lockdown. 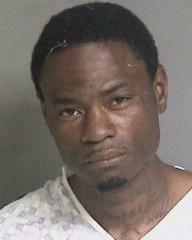 Officers were able to identify the suspect as Marquise McClinton (31 year old Fremont resident). Unfortunately despite the efforts, McClinton was able to evade officers. 01/09/18: a felony evading incident when he fled from Pleasanton Police in a vehicle. 02/21/18: an incident at the Fremont Hub when he fled from officers who attempted to stop him. 03/16/18: an incident on Ogden Dr. when Officers attempted to locate McClinton who fled from a residence. 03/27/18: an incident near Chapel Way and Bay St. when McClinton fled from officers during a vehicle stop. Monday evening at approximately 10:00 p.m., members of the Street Crimes Unit located McClinton at an address in the 4200 block of Ogden Dr. Patrol officers, several K9 teams, and a Fremont Fire Department UAS (Unmanned Aerial System - drone) responded to serve the warrant. McClinton immediately fled out of the back of the residence. The UAS was able to track his movements until officers made contact. McClinton fought with officers. A police K9 detained McClinton and patrol officers took him into custody. McClinton was booked at Santa Rita Jail and charged with two counts of resisting arrest, a felony probation violation, and two misdemeanor probation violations. The gun has not been located. We are also coordinating with the Pleasanton Police Department on their previous investigation. Anyone with information about these incidents is asked to please contact the Fremont Police Department’s Investigative Unit at 510-790-6900.